When I started this blog, I wrote a post on Panchagavya and its benefits for plants. I didn’t think that it was going to get so popular. 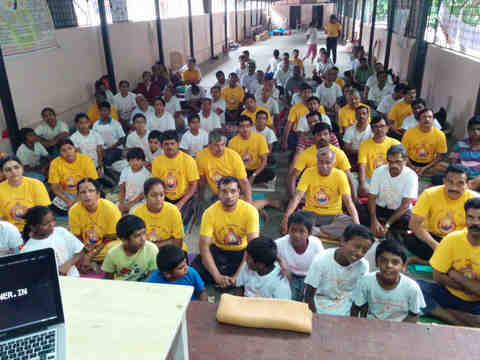 There has been so many requests for Panchagavya. I decided to make an exclusive post out for Panchagavya and its benefits. First things first. What is Panchagavya ? ﻿Pancha means five and gavya means substance obtained from Cow. When you mix the 5 products from cow such as Milk, Curd, Cow dung, Cow’s Urine and Ghee(Clarified Butter) in a proper ratio and allow it to ferment, the resulting product you get is called Panchagavya. The Origins of Panchagavya and its recipe can be traced back to Vrikshayurveda. Vrikshayurveda is a medical science for Plants. It means Ayurveda for Plants. Panchagavya is considered to be an effective organic manure and also acts as a pest repellent. 3% solution is found to be effective in most of the studies done on Panchagavya. That said, one can always experiment with different ratios for different plants. Preparation of Panchagavya is simple. It does take lot of time though. Looking at the requests I was getting I thought I will prepare it at home. But living in an apartment and going in hunt of fresh cow dung and cow’s urine seemed almost next to impossible. When I almost gave up trying I got to meet Vishwanath, an organic grower of Sapota (Chikku) and vegetables. 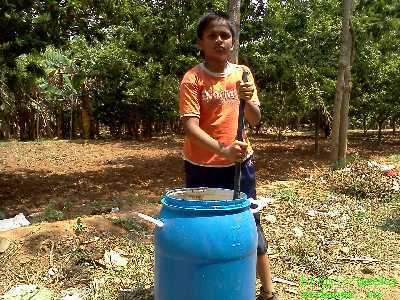 He started preparing Panchagavya for his farm a while back and has been using the same for all his plants. There was a cow in his farm whose products were used in the preparation of Panchagavya(PG). When I discussed with him about making PG available, he readily agreed and was also kind enough to share photographs of the whole preparation of this wonder manure. ﻿Panchagavya is known to contain millions of microbes and adds life to soil. Let me take you all through the steps of making Panchagavya. Traditional Panchagavya used only 5 ingredients from Cow. There has been many modifications to it and more additives has been added to enrich the liquid. Here goes the pictorial guide. Finest Panchagavya starts with the simple thing you see in many places. Cow dung. It is important to use dung of a local breed cow that is free ranging. 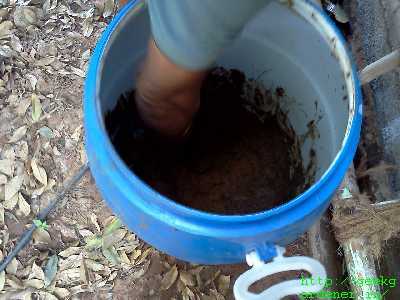 Cow’s urine is added to the cow dung. Ghee is one of the 5 ingredients and that is added in the pic below. 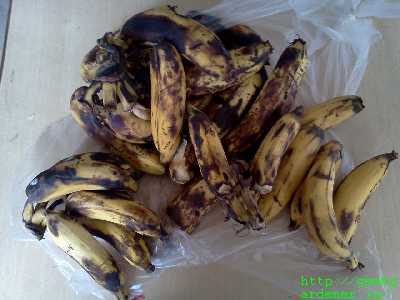 Ripe banana and jaggery provide the substrate for microbes. Tender coconut water is added according to the recipe. Daily stirring is very essential. It aerates the the container and keeps it from deteriorating. The container when all its ingredients are added, it is closed with a insect proof net and kept in shade. It takes two weeks for it to be ready. After two weeks, It is ready for usage. 30 ml of it is mixed with 1 litre of water and can be sprayed on leaves or applied to the soil. If you are using a sprayer it is good to filter out the sediments and then spray. Here is a chemical composition of Panchagavya in its concentrated form. To buy Panchagavya, please send an email to Vishwanath (panchagavya108@gmail.com) or send me a note. 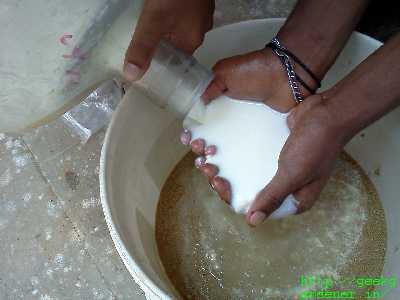 The price of Panchagavya is Rs 100/- per litre. For convenience, I have some limited stock in my place in Bannerghatta Rd, Bangalore. For large quantities, please send a mail to Vishwanath.BTW, Vishwanath is a grower of Organic Sapotas. Do contact him for supply of pesticide free chikkus. See you all in next post! Definitely I am interested in PG but I have few questions if you can answer. 1. What should be the dosage of application in a 10 inches container? 2.No. of application in a month. 3.Do we have to increase or decrease the no. 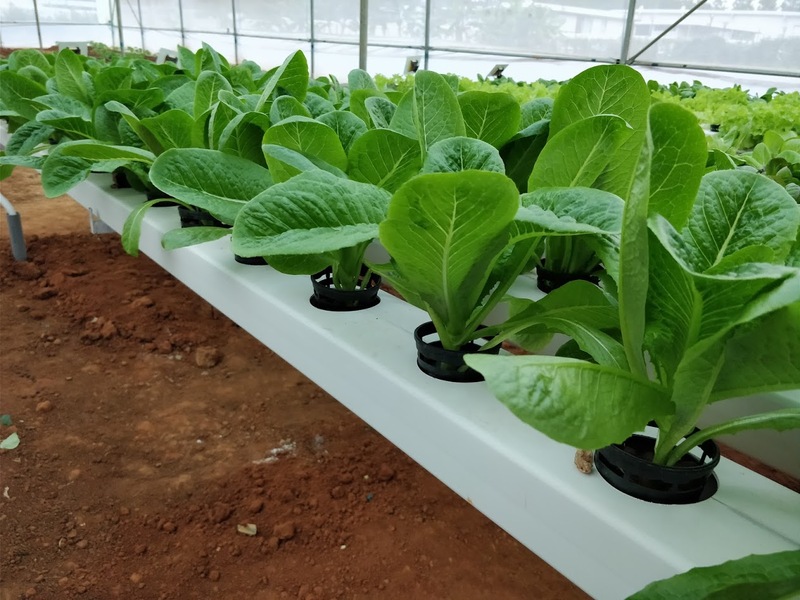 of applications depending upon the stage of plant like, foliage/flower/fruit stage. 4.If we see any deficiency in plant should we increase the no. of application or we have to give additional supplements of particular mineral. 5. How should we store PG like temp. light factors and for how long can we store it. I know there are too many questions but I am sure the answers will satisfy inquisitiveness of many fellow gardeners. Excellent questions. I should have made these points part of the post itself. I will update it soon. 1. 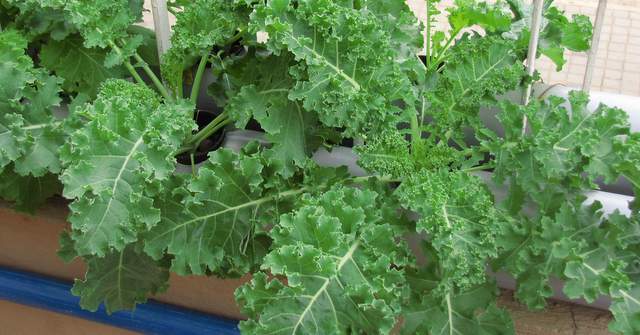 For a 10 inch container, you can water it with 3% solution like you would with regular water. . Foliar spray is also helpful. Do it in the early morning. 2. Normal dosage is once is 15 days. During flowering and fruitset increase it to once is 10 days. 3. PG has trace elements in it.However, should a mineral deficiency occur, it is good to supplement it with a particular mineral. 4. When stored in a cool place and with daily stirring, it can be kept upto 6 months. Seal the container with net to prevent flies from entering and laying eggs. This is very important. Little carelessness here will result in a liquid with lots of maggots. 5. 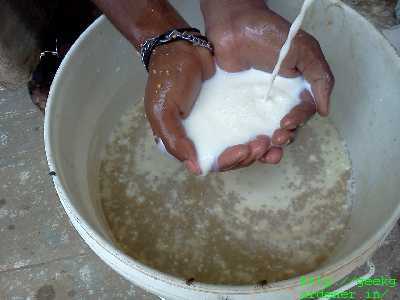 In case, due to evaporation, PG becomes thick, dilute it with water or cow’s urine. Hi GG, I’m interested in 1litre of PG, but would be able to pick it up only in May. If it would be possible to pick it from you, that would be most convenient. Otherwise I’ll contact Mr. Vishwanath. Also interested in the answers to greenenthu’s questions. Thanks for the info on how PG is made. Nice post! My grandpa would use Ganjala (cow urine) at his farm to keep pest at bay. Unfortunately, we rely on chemicals to a larger extent. I am bookmarking this page for reference. Would help if the stocks are available on regular basis. Nice to hear the use of Cow urine. Thanks for bookmarking and yes we do plan to stock PG all the time :). Thanks for PG and other seeds. The Plants that we have bought are good & healthy. We speak to them every morning 🙂 , will take to hometown tomorrow. Need to know where we get bonemeal for Roseplants. Bone meal is available with me. You can check it out in NT pet. Very nice , i am interested to buy ,any outlet in Chennai? I am into container/Balcony gardening with 50pots , want to know if this foliar application will leave any smell for long (as our balcony is in Bedroom ). Does PG do the Job of fertilizing as well as pesticide? Or you still have to use 19-19-19 NPK? 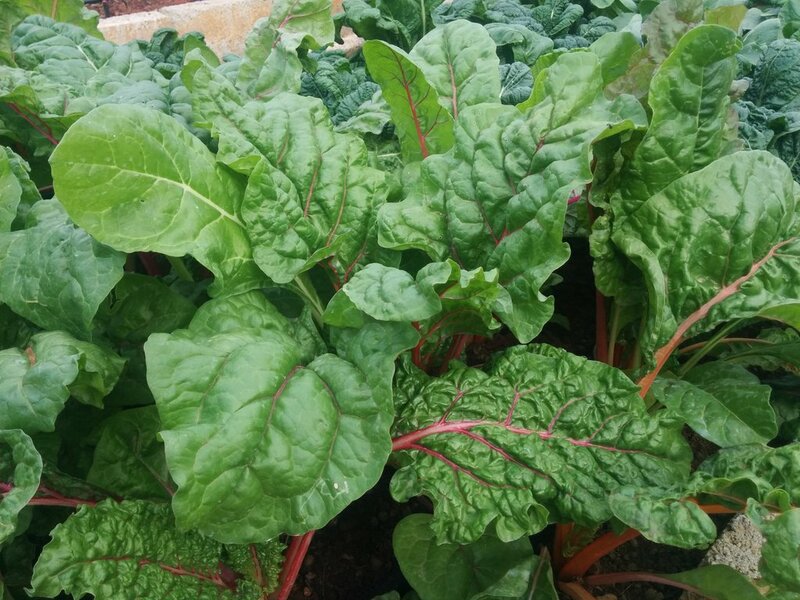 I am really looking to use only organic or natural stuff if possible…..
PG will supplement the fertilizer by adding more microbes to it. For containers, if you get good quality compost, you don’t have to add 19 all. I would be keen to try 1 L of PG. Can it be delivered outside Bangalore (Delhi)? I would pay for necessary postage/courier charges. Thanks for taking the initiative and sharing benefits of PG! I am interested in buying half a liter of PG. I live on Bannerghatta Road, Bangalore. Please let me know when and where can I get it from you since you said you have a limited stock. Thanks for the recipe – this is great. Do you mind if I share this info on my blog – wwww.techie2aggie.blogspot.com with due credit, of course. I have also subscribed to your blog, good job on all the info. Feel free to subscribe to my blog if you are interested. One query I had regardng Panchkavya was can we spray this on young saplings as well? Thanks. I will get back to you about the sharing part. Yes you can spray PG on saplings. God Bless you Dude! You are something else! And may i confess that i am an unadulterated fan of yours – Forever!!! Thanks Ajay for the very nice words. All this was possible only because of the motivation and appreciation provided by readers and enthusiasts like you. is it worth to use milk, buttermilk, ghee, fruits to make a manure or growth promoter for plants when these human food items are in short supply in the country. 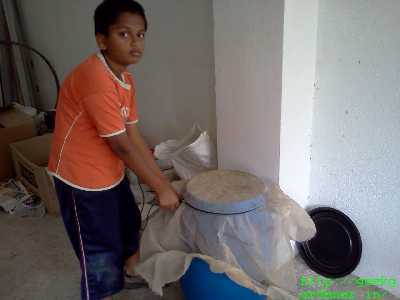 why cannot we think of a product which can be dreived from a useless so called waste or pollution. Thanks for your point. This is a preparation that’s been used since centuries and is known to work. 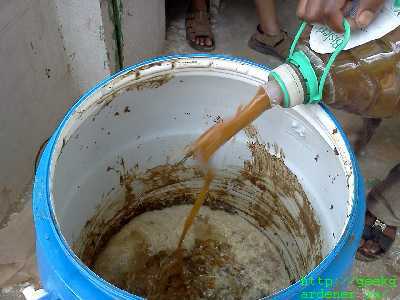 Besides this there are several preparations that use leaves of weeds, cow urine etc. Would you like to volunteer? Please confirm if you have the stock of Panchgavya available with you. If yes then can i collect the same from your place in the weekend. How long can these be stored without them getting spoilt? I have this problem of mealy bugs (white wooly ones) and black ones (all the leaves of my plants are covered by them). I used panchgavya I got from you a few times; but still these bugs are all over my plants (rains only seem to make it worse). Is PG effective for these bugs? What’s the proper way to use it? Should i use neem oil instead? Thanks for the nice post.May I know the expiry range for PG? For example If I get PG from you & my usage is not very often,So for how many days can I store & reuse it? pl tell the exact quantity of five ingredients to be mixed for daily consumption for self. This is the first time i writing in your blog. I basically have an intrest towards gardening, but never tried much.But after going through your blog i have deided that i should have a garden in my bolcony…. its really motivating. I want to try Hydrophonic gardening. but problem is i stay in a rural area and i wont be able to get the seeds , nutrient solutions and coco peat. Is that possible for you to send by courier. And I want to know if PG can be used as nutrient in hydrophonic system to grow veggies and leafy veggies??? Can you provide contact number where I can buy this product? i want to purchase PG, but i live in Nagpur. Can please help me as to how i cam purchase PG from you. I want to buy 1 L of panchagavya. Can it be couriered to Delhi(NCR)? I will pay the necessary postage/courier charges. I have started gardening recently and need Panchagavya. Please let me know if it is available anywhere in north Bangalore. Why did Indians surrender so easily to western chemical and poisonous agricultural techniques,that requires years of university studies??? Why did authorities allow such ignorance to go on? I hope real pure agriculture and pure products will take over and lead the whole world into a new era of health/prosperity!!! I need panchagavya 1 litre. can i get it from your place on this saturday \ sunday. May be you can also give me some seeds such as red\yellow bell pepper. Is this PG same as compost tea? Can I use compost tea made from cow manure compost? 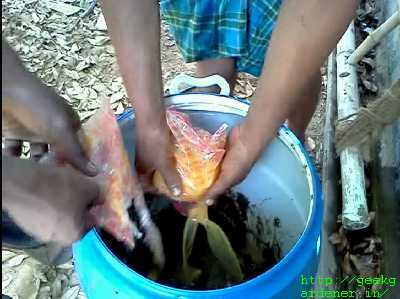 Another point, why not use an aquarium pump fitted inside the bucket,used to make PG instead of stirring by hand? I am supporter of organic farming and i want to use Panchgavya for the management of fungal diseases in tomato and other vegetable crops. Presently i am residing in Udaipur, Rajasthan where i do not find any shop selling Panchgavya. Kindly suggest me the place and shop contact no from where I could purchase it. for better health, is that True. Panchagavya can be consumed by people as well. But I am not sure about the quantities and all that. I dont consume and the ones we sell in the store is strictly for agricutural use only. This is Ridhima (Gagan’s cousin). Firstly congratulations for your bundle of joy! I’ve been a silent viewer of your site and this is the first time Im writing in. We have a new kitchen garden with radish, beetroot, some green leafy like dhante, sabakki and basal sappu (sorry i dont know the english names for them), Mangalore cucumber, few flowers to begin with. The beginning was very smooth n healthy, but now we have noticed aphids on all the plants. The leaves are filled with these bugs. I had read earlier about PG on your site. Just wanted to know can I order PG to be delivered to Basavangudi and how effective would it be for the fact that pests are over populated 🙁 Also let me know what should be the ratio at least initially to fight the spread. how can i order it from you? i want to try a 1 ltr bottle first for my plants.. let me know the price and how to order.. I want one litre of Panchgavya solution for my plants. I stay in Delhi/NCR. Please let me know if you can courier it and what is the cost of it. Saw your article in the Hindu looked through your website. Great to see that you have jumped in where many of us have quailed :to provide this amazing source of information. Would like to know if you still run your store as your last post was in Oct 2012 ? 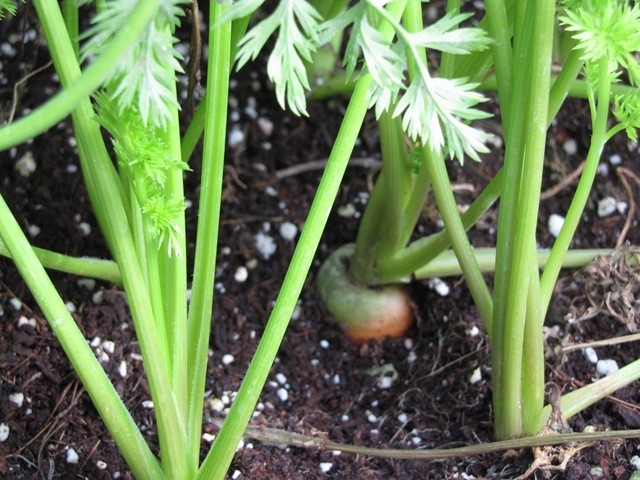 I am an amateur gardener and have a small patch where I have started to grow Veges and some fruits. Have been doing it successfully earlier on the Terrace of my old apartment. Enjoyed what I saw on the site. Good job. Thanks for writing Anjali Yes I do run the store. I have been following your site for a few months now and I must say- hats off to you. Thank you so much, yo and your site are a great source of inspiration! We have a terrace of around 1300 sq.ft and encouraged by your site, I have decided to start our very own terrace garden. I would like to know where can I buy Panchagavya in Pune/Mumbai. Would be grateful if I could have some points. I tried searching online but couldnt find any. You can write to Sudhir . He will courier it to you. I recently bought some PG from a farm. But it smells of fresh cow dung. Does that indicate anything? It should have a fermented smell. When you say smell, does it stink? Can you delivery to Chennai ? No. Panchagavya is not taken by many courier companies because of its liquid state. Can you please confirm if u can send panchgavya to Odisha through any courier.Thank You for inspiring us to get into gardening/farming. Couriers dont take liquids so we cannot send at the moment. Sorry, this is in Bangalore. Impressed with your efforts i have motivated about 20 families to start terrace gardening. our jukuni and brinjas are infested with “aphids”. cold you please suggest a solution. Can we order online if an organic pesticide is required? I require 1 litre of panchagavya. I live at Thrissur, Kerala. Can U supply it to me? I am interested in purchasing PG for my potted plants at Kanpur, (U.P). Do you supply bulk packing and can it be sent to Kanpur pin code 208002? I regularly use Panchgavya for my plants. and I order it from greenmylife.in. I think GG has stopped keeping PG now.. Hope that helps!! Good Post with a lot of tips . I appreciate your efforts . I remember my grandfather preparing panchagavya and giving us very year once 2 teaspoons in the starting day of karkidakamm month in kerala , Somewhere in the mid of July month .It has a lot of goodness in it !!! 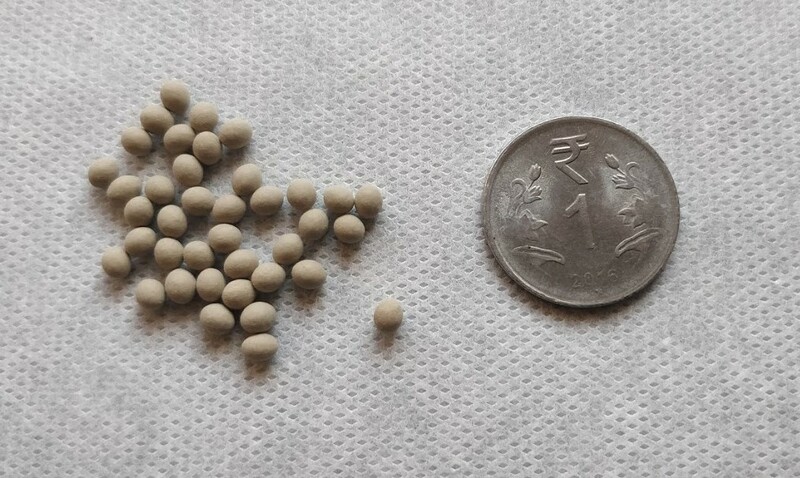 Hi, I would like to know if any special large-bore sprayers are available to spray panchagavya. Thanks. 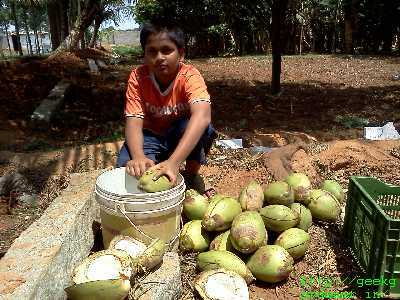 I have 132 coconut trees and 9 mango ntrees and few sapota trees and gova and jackfruit trees. will 1 litre pg be enough for these plants for six months. if so i live in mysore could you send it by any transport if I pay you the money in addvance. You need more than 100 liters. You need to calculate based on the spread and the volume you are spraying. I dont sell panchagavya.